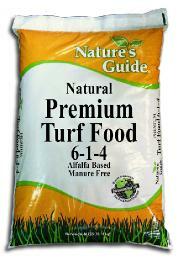 Nature’s Guide premium turf food can be used on all lawn grasses. The formula yield of 6% nitrogen (N), 1% phosphorus (P), and 4% potash (K) are required for healthy plant growth plus natural growth. Beneficial organic matter from the alfalfa meal, soybean, meal, natural molasses and seaweed, build microorganism populations and improves soil structure. 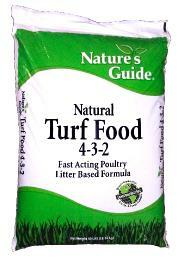 Nature’s Guide turf food is made with poultry litter base. Poultry litter is rich in natural nitrogen that is quickly liberated in the soil to green up grass and keep it green. 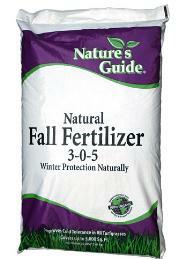 Fall Fertilizer provides much need protection to grasses during the winter months. The 3-0-5 formula using natural occurring potash provides important nourishment to the root systems. 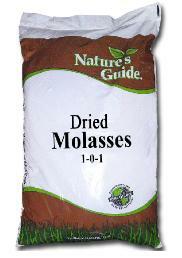 Nature’s Guide dried molasses should be the first step in rebuilding and maintaining lawn and garden soil. Molasses have no peers as an all round soil builder for boosting microorganism grown and health. Natural sugar and high carbon content provide soil microbes energy to convert organic matter and soil minerals into elemental nutrients for growing plants. 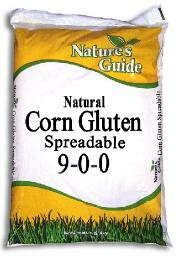 Nature’s Guide corn gluten has a high nitrogen content of 9% that provides plenty of nutrition to lawns without burning. Corn gluten is used primary as a weed seed pre-emergent on lawns. 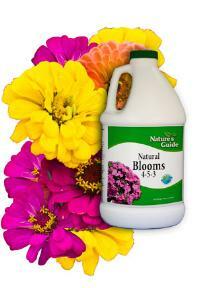 Use Natural Blooms fertilizer to maximize buds and blooms. The pelletized formula consists of alfalfa meal, bone meal, our heat pasteurized poultry litter, sulfate of potash, dried molasses and, dried seaweed. 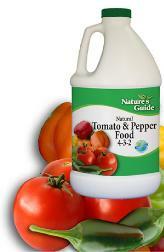 Tomato and pepper food works with the whole vegetable plant. Healthy plants with healthy roots, leaves, and stems produce better yields. The formula is completely natural and safe to use even during harvest time. Nature’s Guide Rock Phosphate is a naturally mined rock that contains high concentrations of naturally occurring phosphorus. It works with plants to encourage fruiting and blooming. 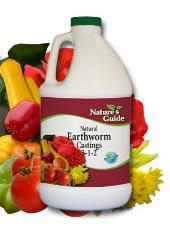 Earthworm castings are rich in water soluble nutrients. In addition to the beneficial fertilizer it provides a rich source of good microbes and bacteria. Natural shale is heated until it expands or “pops” producing a stable, porous, lightweight, natural substance that open heavy clay soils end enhances root growth. Each particle of expanded shale acts like a tiny sponge to hold moisture which it slowly releases as the soil begins to dry. Nature’s Guide Lava Sand is a natural sandy substance consisting of crushed volcanic slag or dried lava. In the cooling process this material was left with many tiny holes. In clay soils it separates the microscopic particles to improve penetration of moisture and oxygen. Texas Greensand is formed from marine deposits. It’s rich in iron and potassium and holds water which it releases slowly. 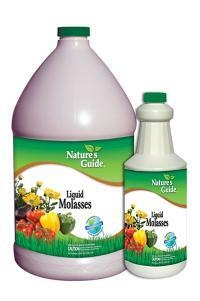 Liquid molasses offers the same benefits as molasses in a liquid form. 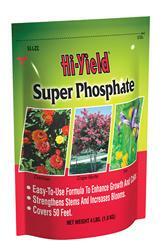 It can be used as a drench or foliar spray. 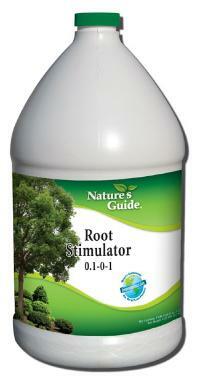 Nature’s Guide Root Stimulator is the first step to success in any planting project. Made from all natural ingredients including biostimulants, like seaweed and plant extracts it works with everything from seeds to the largest trees. 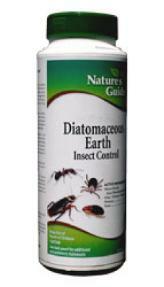 Feed Grade diatomaceous earth is the purest form of this product. It is commonly used as an additive to animal feeds. 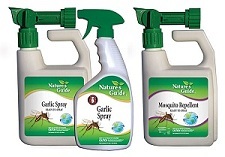 Nature’s Guide garlic spray is an all natural insect repellent that works for hours. It’s mixed with just the right amount of garlic oil to make a safe, effective, and convenient spray. 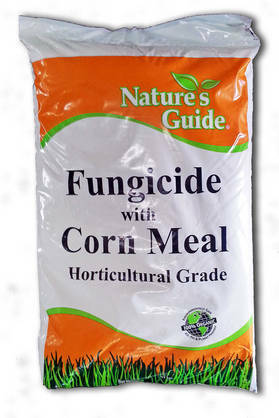 Nature’s Guide fungicide is a combination of dried garlic blended with horticultural grade corn meal. The natural fungicidal properties of garlic work along with corn meal’s ability to stimulate the growth of beneficial microorganisms that feed on different noxious fungal species. Use on lawns, flowerbeds and vegetable garden to control and prevent fungus diseases.